Retired Consultant, Brinker International, Inc.
Doug H. Brooks was appointed to the University of Houston System Board of Regents by Governor Greg Abbott in 2018 for a six-year term and will serve through August 31, 2023. For fiscal year 2018-2019, he will serve as a member of the Endowment Management Committee, the Audit and Compliance Committee and the Finance and Administration Committee. Brooks is the former Chairman of the Board, CEO and President of Brinker International, Inc., whose current brands include Chili's Grill & Bar and Maggiano's Little Italy. 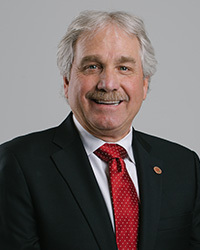 Brooks joined Chili's in 1978 as a manager at the company's original location in Dallas; and rose through the ranks at Chili's holding numerous positions including General Manager, Area Director and Regional Vice President. He was named President of the brand in 1994. In 1999, he was promoted to President and COO of Brinker International. CEO and Chairman of the Board were added to his title and responsibilities in 2004. In 2013, Brooks handed the reigns over as CEO and President, and later stepped down as Chairman after a successful transition of leadership. Today, Brooks serves on the Board of Directors for AutoZone, Southwest Airlines, and The Limbs for Life Foundation. He also serves on the professional advisory board of St. Jude's Children's Research Hospital, and is the Chairman for the Dean's Advisory Board for Conrad Hilton College University of Houston. Brooks earned his B.S. in Hotel and Restaurant Management from the University of Houston in 1975.